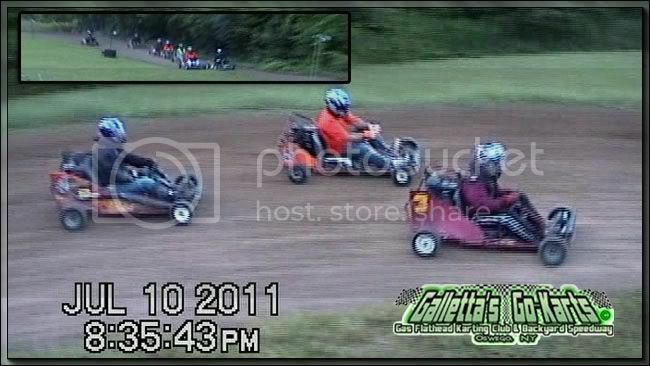 Galletta's Karting Club | July 10th, 2011 Race Results & Videos - 50-Laps + Heats - The largest & longest-running Dirt Karting Division in Oswego! JULY 10TH, 2011: Seven competitors battled it out on 7/10/2011, and although we have had the smallest summer fields in our recent history, the racing is as close and exciting as ever, and perhaps cleaner. Where else can you see open-wheel go-karts race side-by-side, sometimes three-wide, and race clean and run 50 laps (plus 8 lap heats) with barely a caution all evening? Sure, Matt Stevens won, but it wasn't easy. 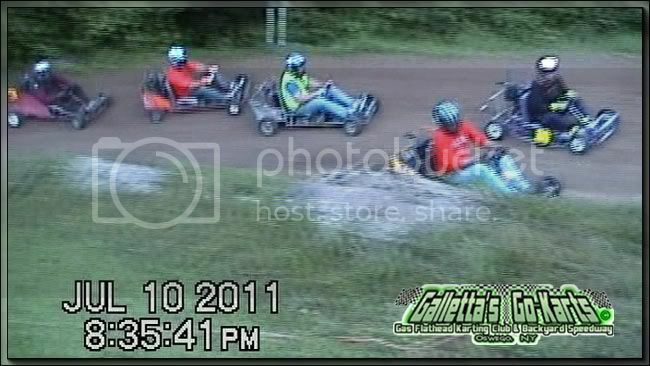 Galletta's 2011/7/10 Karting - Great Finish during Fiffy-Lappah Race! YouTube video to this race is currently being produced and is forthcoming. All picture captures & video clips are directly taken from our weekly DVDs, which are almost always available to buy the day after the race. Above is this race's menu. 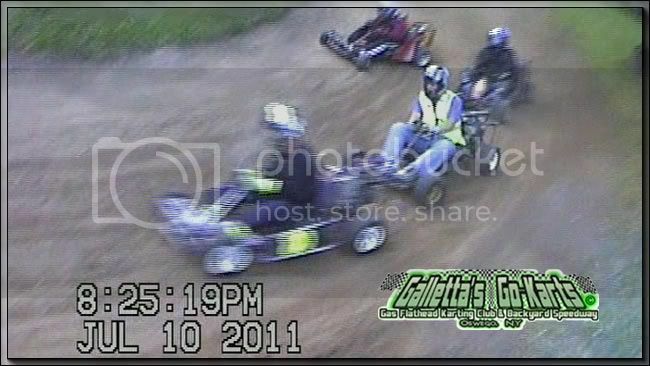 For a DVD copy of this race, please e-mail or call Chris Stevens and ask for Galletta's Karting Club 2011 Volume #3. Each disc is chock full of between 1 to 3 hours of racing, predominantly from multiple angles and are only $5 each (discounts available for multiple copies). We accept PayPal or cash, and can either ship or arrange for pickup. Jeff Tetro led this one from start to finish. Joe and Justin tangled in turns 3 and 4 for Matt to shoot under them for 2nd. Retcon Race held on 7/10/2011 earned points for 6/12/2011. We usually do 10-lap heats and 45-lap features, but decided to leave the extra racing for the feature and ran 8-lap heats and a 50-lap feature. Besides, with only 7 competitors, the races usually run smoother and quicker. The more drivers does increase chances for accidents (bad thing), but also provides more competition and usually harder to get passes and we usually get a bigger and more varied winner's circle (good thing), so we prefer more people out there. Polesitter Jeff Tetro looked like the winner early, pulling away and looking like he'd lap the field, but bad luck struck as he a blew a drive tire on the #9. He climbed into the #0 for the rest of the event. Tim Galletta looked poised to win by inheriting the lead with a fast kart, but pitted to adjust tire pressure while in the lead and had to go to the rear. Late leader Joe Sereno had a half-track lead for a large percentage of the race (and earned many leader bonus points from that lead), as Melissa Stevens held off the rest of the field (in her #80 kart). Here she is seen holding off Justin Galletta (#7), Chris Stevens (#4) and Matt Stevens (#3). However, once Matt and Chris got by Melissa, they began to hunt down Joe. It may not have happened if not for but a caution and then traffic did rookie in, as Matt - who himself had to fight off his brother the whole race - snuck by him with three laps to go in a pack of 7 karts bottled up wheel-to-wheel to barely pick up the win. These above and below pictures showed how Matt was able to trap Joe in the outer groove using traffic. Joe and Chris then trapped each other back and forth as they both tried to get Matt back, but the laps ran out. 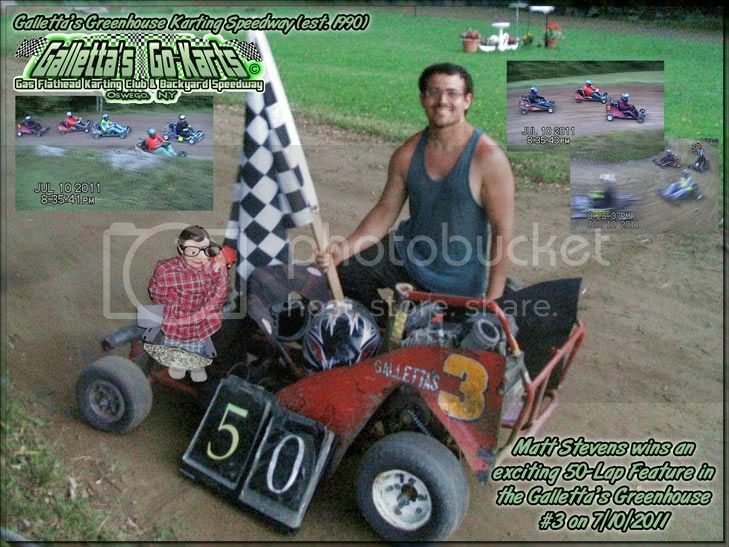 The two camera-persons - Aou Stevens and Gene Galletta - said that it was the best race in maybe years because of the tight, wheel-to-wheel, clean racing, and close finish that needed traffic to alter the outcome! Several race-ready, feature-winning karts again sat idle without drivers, and it is easier for Matt to pick off a seven or eight drivers and win than it is for him to do so with ten to fifteen drivers. So we need more -- come on out! So if you are sick of seeing Matt win so much, then do something about it and race him like the rest of us active GKC drivers are doing. If you did, you'd see why he's the most winningest driver in the area. Weighed down, same motor as everyone else, older chassis than anybody else, starts in last almost every week... and he still triumphs. 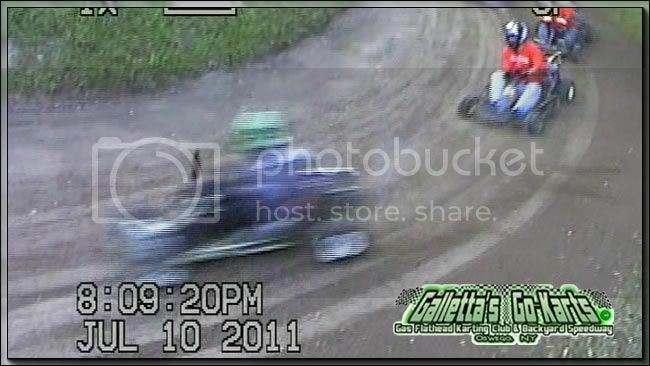 Racing more expensive karts on kiddie tracks doesn't mean you're a better driver. Just means you're afraid. Yes, that does mean local racers who read this page, can race with us, but never show up on race day. We have heard that Oswego is a race fan town. We have seen the crowds at the big track, and had been amongst them for decades. We have raced on two local tracks, won on both, had good races on both. So, we know racers and race-fans do exist here. So where are they? Sunday a bad day? Race other types of karts and look down on our division? Heard people gossiping about us? I report *everything* on this website - good, bad, or indifferent - so if you don't read it here, then it is probably untrue. Aspiring racer but afraid to try? Nonsense... we race clean, safe, and always have fun. Come on out! Everyone who has raced here knows that you cannot race this competitively cheaper anywhere. So what's the excuse? You think you have ideas and suggestions? Tell us. You think you can race? Great! Let's race and we'll see! For the Galletta's Karting Club's World Championship of 1WD Gas Flatheads held on Galletta's Greenhouse Backyard Karting Speedway for the 2011 season to date. Our complete All-Time Points Standings from 2000-to-'last-completed-season' are found on this webpage, and complete wins on this page.